As I mentioned in my lazy post last week, I wrote an article about writing YA when you don’t read YA on a website for women writers. It was a great feeling to share my “expertise,” but part of that elation was quickly deflated when I saw some Twitter commenters blindly bashing my piece. It was an odd feeling to have a stranger become enraged by something you wrote, especially when they didn’t seem to understand what you were saying in the first place. The comments weren’t directed at me, but rather to the website that featured my piece, which left me feeling like I would have to seek out these people if I wanted to defend myself. The comments basically concluded that I was a literary snob who looked down on writing young adult fiction. The evidence for this was that I had used the term “easy” for describing writing YA. What the commenters seemed to ignore was that I was saying that is other writers’ potential and uneducated excuse for writing YA. 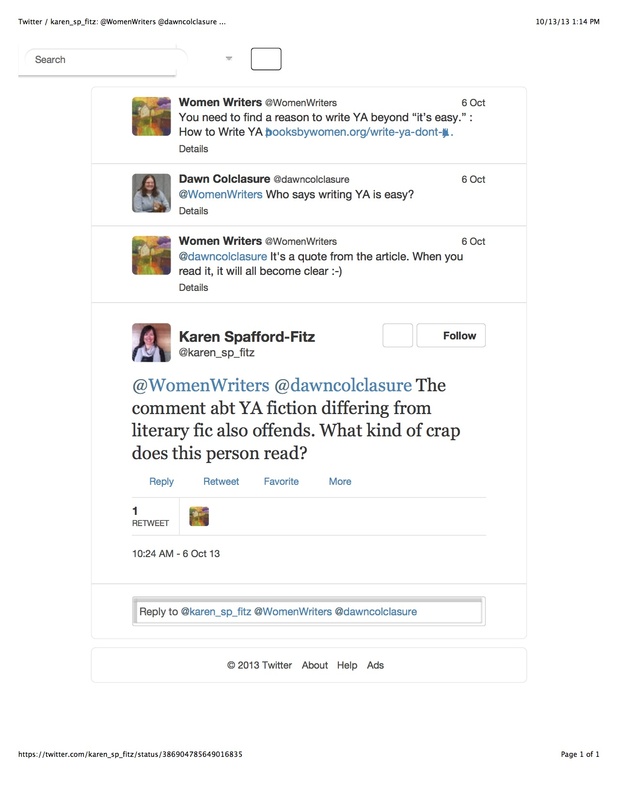 I even mentioned that YA author Kerry Cohen had complained that is the reason why some writers decide to try YA. Speaking of Kerry Cohen, I was quickly reminded of this same issue happening when I interviewed her for a women’s website I write for, but in her case the comments were much more and much worse. When I had interviewed Cohen, she told me that because she wrote a memoir about her sexual experiences as a young woman, people (often other women) constantly flooded the comments sections of her interviews with hateful and mean comments, both about her writing and her personal choices. I had felt amazed that such a kind and thoughtful woman I had met personally would be the victim of Internet trolls. But it happens everyday to writers. The Internet, for all its good, has a nasty habit of convincing people that they can say things online that they would never (I hope) say in real life. I went to a bookstore event this past Monday that featured a conversation between writers Jennifer Weiner (In her Shoes) and Erica Jong that celebrated the forty-year anniversary of Jong’s groundbreaking (and controversial) book Fear of Flying. As women who are not afraid to speak their minds, have been met with mean comments by a variety of critics and wannabe critics, and who have in some cases used the Internet to fight back (Weiner has a notable long-standing feud with literary darling and not-so-nice guy Jonathan Franzen), their conversation quickly turned to the world of Internet trolls and what role the Internet plays in a writer’s life. Jong blamed Twitter for distracting us, saying it “fragments our thought process.” While Weiner appreciated the “democratization of the Internet.” As a writer, and a woman writer especially, she felt that websites like Twitter gives us “a place to voice our problems.” I agree with both women because the Internet can be both good and bad. I would be hypocritical to say it’s all bad since I have a blog and often use Twitter for my writing purposes and to interact with writers I admire. I don’t mean to sound like a wimp who is upset by a comment made by a stranger. More so, I’m annoyed that someone was offended by something I wrote that they took out of context. Alas, you can’t please everyone. Perhaps the lesson here is to stop reading the comments sections.